Born in 1935, Mirella Freni made her professional debut at the young age of twenty on February 3rd 1955 as Micaela in her native town of Modena. The following five years saw a spell in the Italian provinces, marriage to the conductor Leone Magiera, the birth of their daughter and a season with the Netherlands Opera. The operatic experiences and coaching by her husband were the foundations of the career that was to follow. This certainly continued into 2002 when she learned Russian to sing Joan in Tchaikovsky�s Maid of Orleans at the Teatro Regio in Turin. Doubtless her second husband, the Russian speaking Bulgarian bass Niclai Ghiaurov, who died in 2004, assisted the preparation for those performances. Freni�s international career started in 1960 when she appeared as Glyndebourne as Zerlina. Covent Garden followed in 1961 and La Scala in 1963, where she was Mimi in the renowned Karajan-Zefirelli production that was filmed and is now available on DVD. Freni moved quickly to Violetta under Karajan at La Scala in 1964 and had her first set-back. She recovered well from that disaster and with her �calling card� Mimi conquered the Met the following year. She returned to La Traviata under Giulini at Covent Garden in 1967 with greater success. Although the work was not to remain in her repertoire she made a recording of it under the expert Verdian Lamberto Gardelli. Arts Music have recently issued this. I found her interpretation of Violetta to be wholly convincing particularly in acts 2 and 3 where depth and colour of voice and sheer characterisation are so important. Her Teneste la promessa and Addio del passato (tr. 12) are full of agony and passion although her coloratura in É strano!�. Sempra libera (tr. 11) is rather more correct than thrown off with brio. Having been the Mimi and Zerlina of the 1960s, the queen of the light lyric roles, Freni moved to what she considered to be the heavier end of her fach. The first venture was Desdemona under Karajan at Salzburg in 1970. When the great maestro first broached the subject, Freni asked for, and got, a year to consider. She was a resounding success. This should not have been a surprise because her voice was heavy enough as she regularly showed in her interpretation of Mimi. But its not only weight of voice that matters, colour and cover of the tone are of equal importance. 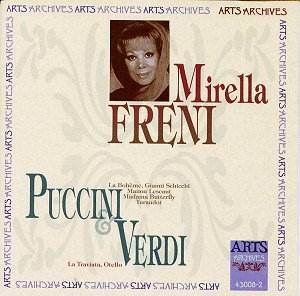 In the 1970s Freni�s repertoire extended in the theatre and on record and this recording of the Puccini and Verdi arias and duets catches her very much at her vocal peak. The title of the disc is a little misleading as the contents include a number of duets with the tenor Franco Bonisolli. As I noted in my review of La Traviata, he is more ardent than sensitive as a singer and he does not have the ideal weight of voice required for Otello (tr. 13). Nonetheless his contribution makes the content of this disc a little different than the run-of-the-mill recital disc. Not that any disc including Freni in fine voice is likely to be run-of-the-mill. What made her the Mimi of her generation can be heard in Si, mi chiamano Mimi (tr. 5). The colour, phrasing and support for the voice are outstanding as is her understanding of the part as she conveys Mimi�s fragility and then growing confidence in the duet O soave fanciulla that follows (tr. 6). Her voice is of ideal weight and colour in the two excerpts from Manon Lescaut (trs. 3 and 4). This is a role of which she made two studio recordings. She also recorded Butterfly and Lauretta in Gianni Schicchi, roles she never sang on stage. Her Un bel di vedremo here (tr. 7) matches her interpretation for Karajan on the complete recording (Decca). Although renowned earlier for her ability to sound girlish without loss of colour I find her O mio babbino caro (tr. 1) a little mature whilst her Liu is less naïve and fully conveys all the agony of knowledge and sacrifice (trs. 9 and 10). The Hamburg recordings are rather reverberant whilst the La Traviata is more ideal. The booklet has a brief essay on the contents and Freni�s career in English, German, French and Italian. This disc is an ideal complement to EMI�s �The Very Best of Mirella Freni� and the issue devoted to her in Decca�s �Grandi Voci� series. I recommend it as thoroughly enjoyable and a memento of a great singer at her peak.